The Raiders know Drew Lock. Soon, they hope to know Kyler Murray and Dwayne Haskins better, too. PHOENIX — The Raiders know Drew Lock well. They scouted the quarterback at Missouri. They coached him at the Senior Bowl. They saw him at the NFL scouting combine. On April 25, when general manager Mike Mayock and coach Jon Gruden likely watch another team select Lock in the first round, they will possess an in-depth scouting report on a player they expect to face in the future. A similar book on Kyler Murray and Dwayne Haskins is being written. The Raiders plan to work out Murray and Haskins at the Oklahoma and Ohio State campuses before the draft, respectively. These private evaluations do not appear likely to materialize into either player donning a Raiders uniform, given quarterback Derek Carr’s presence. Still, there are benefits to this intel collection, Mayock said Monday from the NFL spring meetings. The first is the most general. It is important to evaluate all positions, quarterback included. For the Raiders, they cannot engage in this process quietly. Although Gruden and Mayock have endorsed Carr as their quarterback and despite a desperate need for a pass-rushing defensive lineman in the early first round, there’s a public perception Gruden will move mountains for a young quarterback he loves. Right or wrong, this creates an air of unpredictability surrounding the No. 4 pick, where the possibility of a trade also looms. Murray is the projected No. 1 overall pick. Haskins could follow somewhere in the top five or 10. “People are inquisitive because we have three (first-round) picks,” Mayock said. “People want to know what we’re going to do, especially up high at No. 4. The way I would address this is the first piece in my head is OK, Derek Carr is a franchise quarterback. I do believe that. We had Drew Lock at the Senior Bowl, a potential first-round pick. We got to work with him for a week. We did our due diligence. We’re going to see Kyler Murray, and we’re going to see Haskins. It is generally considered worthwhile to scout all positions, regardless of an organization’s need. 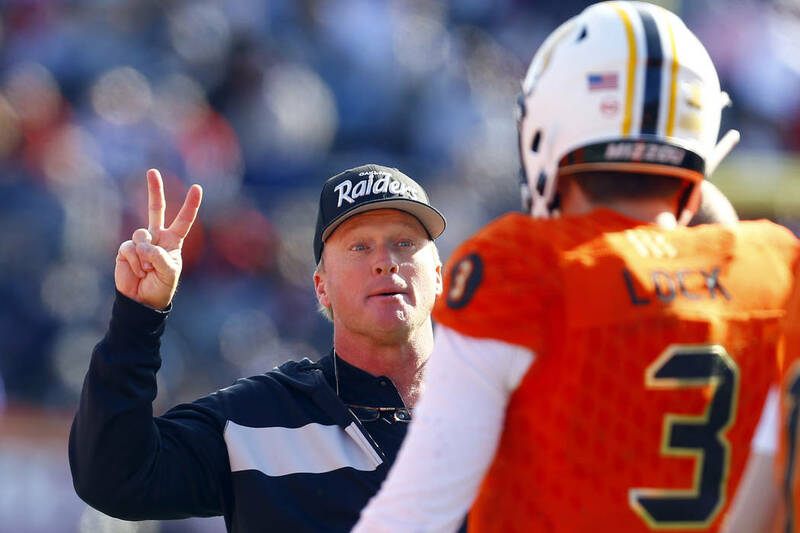 The perception that Gruden could resort to aggressive maneuvering to acquire a quarterback is beneficial to the Raiders. If Murray or Haskins is convinced the Raiders are not a possible suitor, no workout would be scheduled. Gruden creates a scouting window that might not exist otherwise. “Information, to me, is gold, and it always will be,” Mayock said. “And we all know that Jon Gruden is a quarterback guy. Jon’s going to evaluate every quarterback out there every year — every single year. That’s just who he is. As his partner in this thing, I’ve got to be very aware of that, and I think it pays tangential results down the road. No matter where they go, what they do, we’ve watched every throw these guys have made. The Raiders wrote a book on Lock. With Murray and Haskins, their library soon will expand.